The “Triangle” area of N. Carolina will see the launch, November 6, of Palestinian cartoonist Mohammad Sabaaneh‘s new U.S. tour “Picture This! Life and Art in Palestine.” The whole tour calendar can be viewed here. The Ramallah-based Sabaaneh draws a daily political cartoon for the Palestinian daily Al-Hayat al-Jadida. Just World Books published a landmark first collection of his cartoons, White and Black: Political Cartoons from Palestine, in Spring 2017– and Just World Educational organized a great US-wide tour to launch the book. This year’s tour starts with two public events (and one semi-private event), in Chapel Hill and Durham, NC. 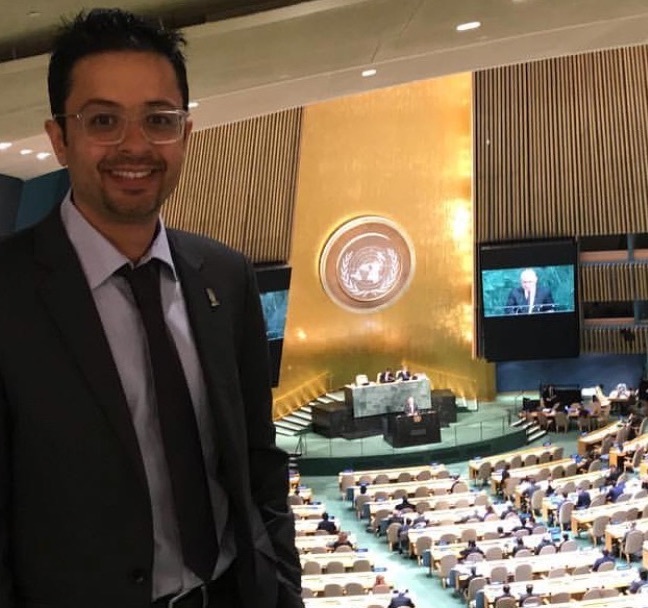 Sabaaneh will then fly to the Pacific Northwest, for events in Seattle and Tacoma, before returning to the east coast for a number of events in Manhattan, one in White Plains, NY, and others in the New Jersey towns of Orange, Newark, and Clifton. He will also be featured at the landmark opening in Washington DC of an exhibition of his powerful linocut prints. As noted above, the tour calendar can be viewed here. Please share it widely with your friends and networks! When I do linocut, I feel… that I am creating a version of myself as well as creating art. The amount of wet black ink on the paper reflects me, and reflects the world around us. 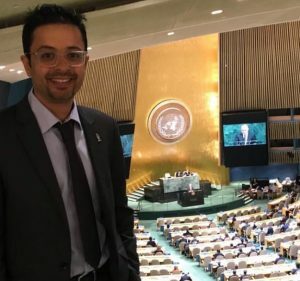 … I ask how I can share my world, as an artist and a Palestinian, with the rest of the world’s people? Surely, by art! I refuse to keep art only for the elite, in museums or exhibitions. Art should elevate the people’s awareness and the artist should carve the dark world to create beauty—like linocut. At the November 17 event, Sabaaneh will be discussing his art and his life with Robert (“Bro”) Russell, the Executive Director of CRNI. 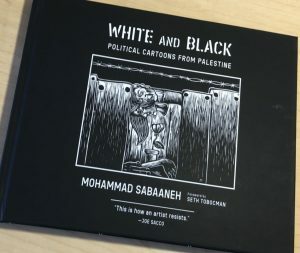 At the event, Just World Books will also be debuting the new, hardcover “deluxe” edition they’ve been producing, of Sabaaneh’s White and Black. 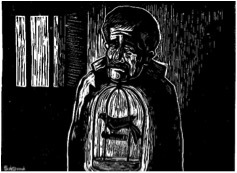 The exhibition of Sabaaneh’s linocuts will stay at the Jerusalem Fund Gallery until December 15. Please share all the news of the above events, or the tour calendar, with your friends and colleagues!